This Strv m/38 tank was a head of its time when it was designed. 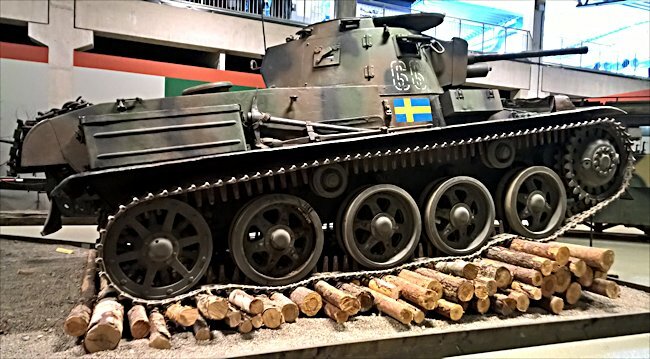 The Swedish military wanted two tank battalions but due to monetary constraints they had to be content with one. It would consist of 16 Stridsvagn m/38 tanks armed with 37mm Bofors guns and 46 Stridsvagn m/37 light tanks armed with two machine guns. When World War II broke out on 1 September 1939, Sweden only had 16 Strv m/38 tanks that were capable of combating enemy tanks. This tank was technically advanced compared with other inter-war tanks because it had a welded chassis rather than a riveted chassis. This meant that the Strv m/38 was much stronger and less likely to crack open, when hit by an enemy shell, at the armour plate seam. The rivets you can see on the front of the tank were to hold internal structures and equipment in place. The German Panzer II tank only had a 20mm cannon where as this Swedish tank had a new 37mm Bofors gun mounted in the turret. The tank was designed and built by the part German owned Swedish company called AB Landsverk. German Tank Designer Otto Merker (1899-1986) joined the staff to assist with the new tank project. The company name for this tank was the L-60. It was an advanced design that fixed some of the problems found with their earlier tank prototype the L-10. This earlier tank had been built in 1935 on the designs of WW1 German A7V amd LK-II tank designer Joseph Vollmer and undergone battlefield trials. The order for 16 Strv m/38 tanks based on the AB Landsverk L-60 tank was placed in July 1937. Deliveries of completed tanks began in 1938 and ended in August 1939. Otto Merker was made head designer of the AB Landsverk company after the German Government purchased a large proportion of the Swedish Companies stock. The Landsverk L-60 was significantly lighter than the earlier L-10 design at 8.7 tons instead of 11.5 tons. L-60 m/38 was similar to the Czech built Strv m/31 in that it had a welded slopped armoured hull. This added to the protection of the crew, as an angled armoured plate was harder to penetrate than a vertical plate. It also assisted in keeping the tank's weight low. To keep the same amount of armoured protection offered by an angled plate using a vertical mounted plate would have required the metal to have been a lot thicker and heavier. The Strv m/38 was fitted with a new torsion bar suspension system that gave the tank excellent cross country performance for their time. 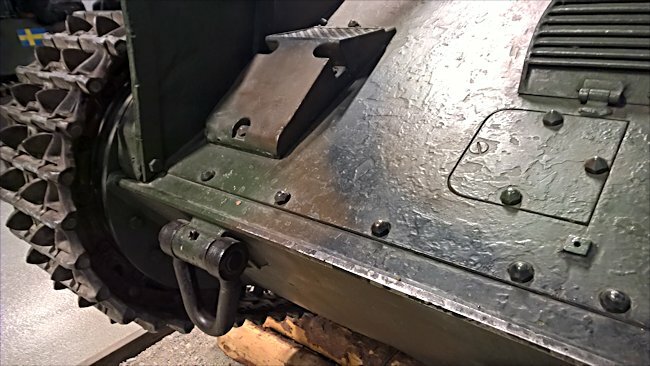 The hull armour plating on the front of the Swedish Strv M/38 tank was welded not riveted. 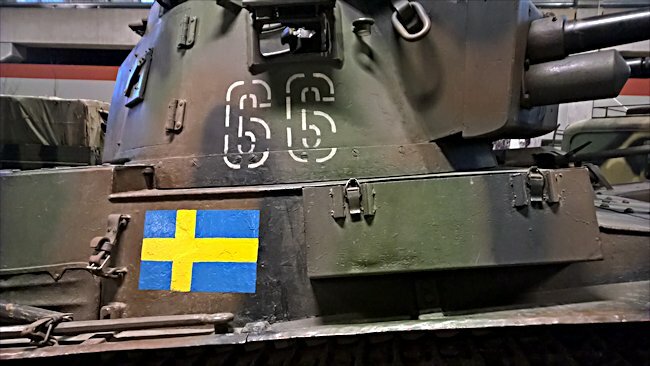 Who else used this Swedish tank? Two L-60 tanks were exported to Ireland for evaluation. Austria and Hungary each purchased a tank for trials. Hungary licensed the manufacture of the L-60 in Hungary and produced 200 tanks for their army. They called the tank the Toldi. It was used during the second world war fighting against the Soviet Union. What are the Strv m/38 specifications? The tank was powered by a Scania-Vabis 1664 in-line 6-cylinder water cooled overhead valve engine that produced 142hp. It had a five speed gear box and a top maximum road speed of 45 km/h. It weighed 8.5 tons (18,700 lbs). Its armour protection varied from 6 mm to 15 mm. It was armed with a 37mm Bofors m/38 gun and an 8 mm m/36 machine guns. It needed a crew of three: Commander, gunner and driver. Swedish M/38 tank with side turret vision flap open. 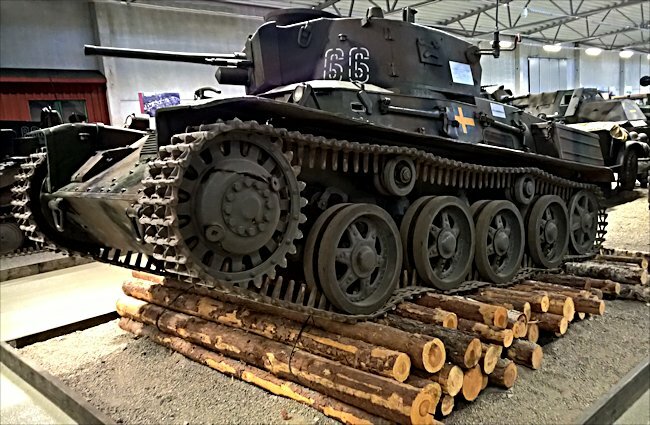 Where can I find preserved Stridsvagn m/38 tanks?